Nine months ago the many eagle lovers in Manassas, Virginia witnessed the removal of the habitat directly in front of our only known pair of bald eagles within city limits. It was devastating to watch. What was once a tranquil field of tall grasses and pine trees has now been replaced by two 40,000-square-foot warehouses and a parking lot. The asphalt rides up to just five feet from the base of the nesting tree. It's a travesty how U.S. 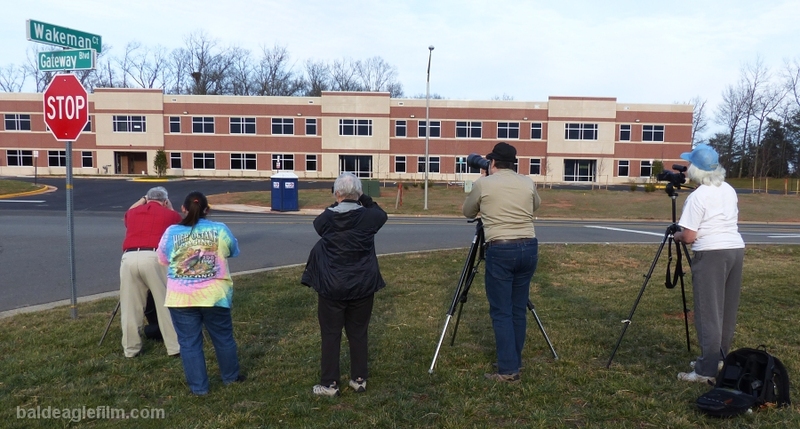 Fish and Wildlife and the City of Manassas allowed this to happen. But the eagles have stayed. They have laid eggs. And now they are raising two healthy eaglets. Yet, ironically, what may scare them away, or worse yet, cause them physical harm, are the eagle lovers themselves. Trespassers disturbing bald eagles on private property. In the past, when there was a spacious field in front of the nest, people kept their distance, for the most part. It was a natural buffer, and people knew that if they got too close, the birds would fly off. Now it seems to be a round-the-clock drive-through ride and snap. 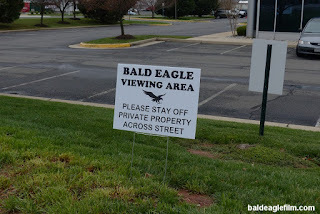 People see a paved lot and somehow feel that they have the right to drive onto private property to get as close to the eagles as they want. There are no barriers or gates to prevent gawkers from coming within feet of the tree. There are only Private Property/No Trespassing signs at the entrances, which most seem to ignore. I've had the opportunity to witness and speak to these many people who seem to think that they have the right to get up close and personal with these eagles. I actually had a local school teacher tell me that "she pays taxes," and that she has every right to view the eagles that close no matter what signs are put up. Wrong. So very wrong. It's private property. Another onlooker told me that she always ignores No Trespassing signs because she "has no intention of doing any damage to the property." Wrong again. And shockingly so. We get it. You want a great photo of the eagles to share on Facebook or Instagram. 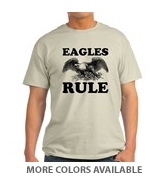 But is it worth the price that these eagles have to pay? At this point, our eagles have no choice but to try to raise this year's young in a hostile environment. They already have to deal with large trucks, noise, and commotion from the warehouse tenants. Why add more to that? In fact, the majority of the traffic disturbing these eagles on a daily basis is the eagle lovers themselves. And I've seen their effects on the birds. I've documented it on video. The parents will often stop feeding their young when too many people are below. If one is resting on a nearby branch, it will fly back into the Cannon Branch Fort Park to get out of the line of sight. They do take notice, and this may ultimately cause them to abandon their nest in time. NEC opens parking lot to eagle lovers. Park in the right lot. There are several great alternative ways to view the eagles. NEC is allowing eagle lovers to park in their lot directly across the street. You can see the nest fine from that location, and the birds will often fly overhead. One has even taken to bathing and drinking from a little puddle of water that fills up just feet away in the adjacent field. You can get some terrific shots from that location. And, you won't be disturbing the birds. Plus, you can meet and chat with the many other eagle lovers in the area. Please give the eagles a rest. Obey the Private Property signs. Know, also, that video surveillance cameras have now been installed to track disturbances. It's a misdemeanor to be caught on Private Property. Don't take the risk. Stay back. Stay off the property. And please be considerate and protective stewards of our National Bird. Eagle lovers taking photos from across the street so they don't disturb the birds.